Enter the Pinlock Visor insert. My wife purchased this for me as a Christmas present, but for sake of practicality and safety, she let me open it straight away! 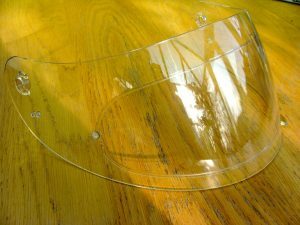 It consists of a new clear visor, with two Pinlock bolts drilled through at the sides and a flexible insert that slides inside the visor, clamped in place between these bolts. 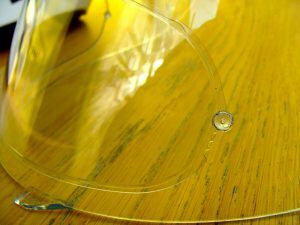 The insert has a silicone border all the way around, to seal it against the visor. Effectively providing double glazing for your visor. Installation was a doddle. First the visor is flexed and flattened slightly, so the insert can be placed inside. On unflexing, it clamps between the bolts. Then the visor is then fitted to helmet and you’re done. In use, it is a complete night and day difference. Visibility through the Pinlock visor is perfect, no matter how cold or wet it is outside. The silicone border does encroach your field of view slightly, but you soon get used to that. In fact, you soon see the area surrounding the Pinlock misting up, highlighting exactly what it is preventing. My glasses do still mist up slightly, but since I can now keep the visor closed, my glasses don’t cool as much and thus don’t steam up so bad. Worst is at junctions when there’s no air flowing through the helmet. But just popping the visor ajar slightly stops my glasses steaming up. Overall, this is essential kit, a real must have. At about £45 for visor + insert, it’s a total no brainer.